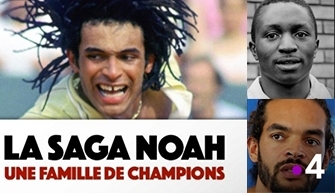 Early March when Imagissime informed me that I’d been selected to narrate a documentary film on the Noah family, directed by Angelique Angeloglou, for France 4, I jumped for joy ! Just the name Noah itself conveys energy. But that was nothing compared to what I felt once I read the script in preparation for the recording. Pride, that’s what came next. What a pleasure it was to tell the story of this family - an amazing, attractive, positive and humane family. Zacharie, Yannick, Joachim – they all have huge amounts of pugnacity, faith, determination, bigheartedness, and generosity stamped into their DNA. One can easily understand why Yannick is sought after to coach athletes : he transmits an indescribable energy that lights a spark, that gives you wings… just like his father and his son. So having shared what I felt while recording, I hope that I’ve convinced you to watch this documentary I was so proud to lend my voice to. But maybe my enthousiasm is theirs ?